This quilt was made for the first son of friends of my husband and I. 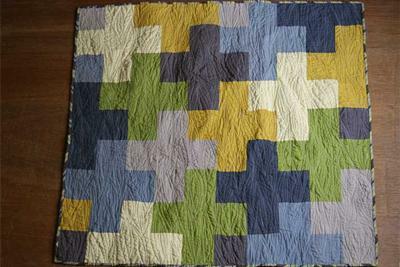 The design was copied from a quilt made by J Casa (or JC Handmade). Check out the original here. Anyway, I chose a color palette I knew would go well with the Owen's room, and the rest is history. It is machine pieced and quilted, backed with a great zigzag print by Amy Butler, and hand bound. More information and photos are here. I've never seen a quilt with this pattern before. It looks very fresh (maybe because of the tetris vibe that a previous poster noticed). I'm impressed. i can see it in many colors. I like this pattern! Kinda like Tetris!